attended performances at many London theatres such as Sadlers Wells with its wide variety of different productions from classical ballets to dance styles from all over the world. The beauty of the dancers with their flexible bodies is always a pleasure to watch; an individual performer or a combination of couples or groups can easily inspire the idea for dance sculpture. One of the first sculptures I created during my training under Howard Bate, R.A was a small bronze resin piece depicting my young daughter tying the ribbons on her ballet shoes; this incidentally was one of the first of my sculptures to be sold. A larger dance sculpture was in realistic style inspired by Rudolf Nureyev and Margot Fonteyn. 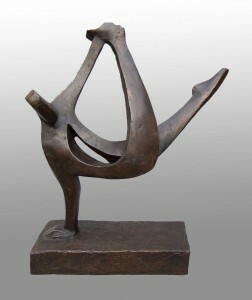 This was followed by an abstract wood carving entitled ‘Family Ballet’ and later on a cast piece entitled ‘Let’s Face the Music.’nd expressive bodies is always a pleasure to watch; an individual performer or a combination of couples or groups can easily inspire the idea for dance sculpture. In recent years my interest has been awakened by the popular TV series, ‘Strictly Come Dancing’. I have created I have a small selection of dance sculpture for sale. These include a number of soapstone and Ancaster stone carvings – ‘Tango’, ‘Salsa’ and ‘Dancing Cheek to Cheek’. There is also a group of larger bronze resin works in editions of 12 and suitable for interiors or the garden – Break Dance, Argentine Tango and Jive. In fact this last piece has recently been cast in foundry bronze for a client who has a number of my works. All in all, the creation of dance sculpture has given me great pleasure over the years and I will continue to go to dance performances and be inspired. If you are not already on my emailing contact list, please let me know so that I can send you news and details of my exhibitions. Just email me at info@johnbrown-sculptor.co.uk. You are always welcome to make an appointment to visit my gallery and garden to purchase or commission a sculpture.